The material used for dental bonding is similar to what we use in composite (white) dental fillings. Dr. Sekhon closely matches the shade of the material to that of your tooth enamel. After applying and molding the material to blend with your tooth, the bond is set with a special curing light. Next, it is polished to create a seamless margin. Once it’s shaped over your tooth and cured into place, it could feel as if your tooth was never misshaped at all. 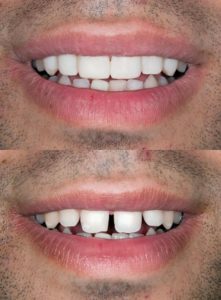 When your smile is altered with a little dental bonding, it can make a big improvement. Bonding is usually a perfect and quick fix for minor irregularities and aesthetic discrepancies. A single dental visit could give you that even smile you’ve always wanted. If a tooth has decay, functional damage or severe fractures, you may need a crown or filling instead. Crowns and fillings offer more structural support to a tooth with severe damage. Dental bonding may not be exactly what you need to have a healthy smile. How can you know whether bonding is right for you? Make an appointment with our dental team and Dr. Sekhon at Gallery Dental! During your comprehensive exam, Dr. Sekhon will evaluate your teeth, assess your smile and help you determine whether or not bonding is the ideal choice for your situation. All treatment is provided by a general dentist. For more complex cases, we often refer our patients to a specialist for treatment. Call us today to schedule your next visit. We also offer veneers for straight, white teeth.